At the core of our research programme is the development of efficient chemoselective methods compatible with biological systems and their use to redesign the structure and function of proteins of biological and therapeutic interest. Chemical covalent protein modification is a fundamental mechanism in chemical biology and protein therapeutics. For example: (i) biophysical probes can be attached to proteins for imaging and tracking; (ii) post-translational modifications or suitable mimics may be installed at pre-defined sites on proteins to provide key biological insights; (iii) lipids may be attached to small therapeutic peptides to extend their half-life in circulation; and (iv) protein conjugates are important therapeutic targets [e.g. antibody-drug conjugates (ADCs) for cancer therapy and carbohydrate-based vaccines against HIV, cancer, and malaria]. 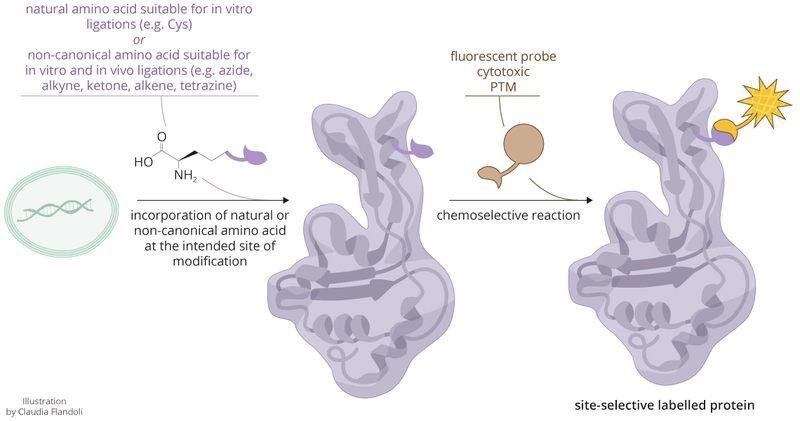 The awareness for the need to develop site-selective protein modification methods and their use to generate chemically defined protein conjugates is recent. Despite several advances reported in the last 10 years, [1,2] there remains a need for additional and complementary site-selective reactions with improved kinetics and selectivities. These methods will expand the current available chemical toolbox and help chemists and biologists to improve further their understanding of complex biochemical processes and to prepare the next generation of chemically-defined modified protein therapeutics. In our laboratory we are currently developing methods that allow for the site-selective modification of proteins and antibodies that are used in the clinic for therapeutic and diagnostic purposes. We aim to develop methods that target cysteine or lysine residues on native proteins and antibodies and that proceed under mild conditions (pH 7–8, 25–37ºC) with stoichiometric amounts of the reagents. Importantly, the conjugates should retain their activity/functionality and be fully stable in biological media. It has been proposed that bioorthogonal chemical reactions be used to label and probe specific biomolecules in living systems. However, specific labelling of biomolecules in their native environment by using chemical reactions is very challenging. Ideally, such transformations should proceed very rapidly in benign aqueous systems with complete chemoselectivity, at room temperature and physiological pH, use low reactant concentrations and non-toxic reagents. The strategy should allow for coupling partners to be easily installed at any position in any protein expressed in prokaryotic and eukaryotic cells. Such a strategy and reaction should be a priori suitable for in vitro and in vivo applications and not interfere with normal cellular processes. Progressive developments in the last decade both in genetic methods for incorporation of designer amino acids onto proteins and reaction engineering for chemical site-selective protein modification has provided a valuable toolbox of bioorthogonal reactions. Even so, the majority of the reactions and approaches available are not able to meet all the bioorthogonal requirements simultaneously, which hinders their use to solve key, unmet biological questions. There still exists a need for reactions and couplings partners that allow for the development of bioorthogonal strategies with improved kinetics and selectivities and whose reactants are stable in cellular environments and plasma and do not interfere with the protein’s innate functions or with normal cellular processes. Such a strategy would allow for the labelling and monitoring of proteins in their native environment without disrupting their structure, function, activity and localisation. In our laboratory we are currently developing small-sized non-proteinogenic tagged amino acids that have alkene functionalities combined with very rapid chemoselective reactions. We are exploring, for example, reactions that can be triggered by light to allow spatiotemporal-controlled labeling of proteins. In addition, we are exploring decaging reactions that are either triggered by light or by reaction with biocompatible reagents. We apply such methods to label and study disease-associated proteins under native conditions. Boutureira O; Bernardes GJL Chem Rev 2015, 115, 2174–2195. Krall N; da Cruz FP; Boutureira O; Bernardes GJL Nature Chem 2016, 8, 103–113. Natural products are an invaluable source of chemical motifs for the inspiration and development of probes and drug leads. Such molecules are prominent in anti-cancer research with ≈50% of FDA-approved drugs since 1940 being either natural products or a derivative. We are currently focusing on harnessing the power of natural product architectures in chemical biology, by identifying on- and off-targets for anti-cancer entities, unveiling the underlying molecular mechanisms of target recognition, and using them as ligands for the selective delivery of cytotoxic payloads. Rodrigues T; Sieglitz F; Bernardes GJL Chem Soc Rev 2016, 45, 6130–6137. The pleiotropic role of carbon monoxide as a signaling molecule in diverse biological events is well established. Exposure to exogenous CO proved beneficial in several animal disease models, such as acute lung, kidney and liver injury, or organ transplantation. Issues concerning CO gaseous safety and the need for highly controlled medical facilities raises doubts over the feasibility of using CO gas in the clinic. As a safer alternative, CO-Releasing Molecules have been proposed for the controlled delivery of therapeutic CO.
We are exploring the immunomodulatory effects of CO as an innovative approach for the treatment of cancer. For this we use our recent discovery that protein modified with a RuII(CO)2 motif at histidine residues is able to spontaneously release CO in aqueous solution, cells and mice. By using a recombinant, non-immunogenic albumin protein modified with the fragment RuII(CO)2, we have shown that this conjugate can deliver specifically CO to tumour tissues while sparing healthy tissues, which results in a strong anti-tumour effect. The effect observed seems to be immune dependent and when combined with a conventional chemotherapeutic drug, the CO-based treatment led to cures in tumour-bearing mice. This innovative approach has the potential to become a highly effective treatment for cancer and was awarded 2nd prize in the RSC Emerging Technologies Competition 2015. García-Gallego S; Bernardes GJL Angew Chem Int Ed 2014, 53, 9712–9721. Ferreira MC; Albuquerque IS; Matak-Vinkovic D; Coelho AC; Carvalho SM; Saraiva LM; Romão CC; Bernardes GJL Angew Chem Int Ed 2015, 54, 1172–1175. Engineered and modified proteins hold great promise for the treatment and prevention of human diseases. Our research group is particularly interested in the specific delivery of toxic molecules to cancer cells and in the construction of homogenous glycoproteins as vaccines candidates. Conventional cancer treatment relies heavily on radio- and chemotherapy. Both of these strategies are commonly associated with severe side effects and in many cases offer very limited benefits to the patient. Thus, there is an urgent need for the development of selective, safer and more potent cancer treatments. A strategy that has received increasing attention during the past decade, is that of targeted delivery. In this strategy, a highly potent therapeutic effector such as a radionuclide, cytotoxic drug or a proinflammatory cytokine is linked to a delivery vehicle to ensure selective accumulation in the diseased tissue. This results in increased concentrations in the intended tissue while sparing healthy cells, thus reducing side effects. The most extensively studied delivery vehicles to date are monoclonal antibodies against tumor cell surface markers. Two radioimmunoconjugates (131I-Tositumomab and 90Y-Ibritumomab tiuxetan) and two ADCs (brentuximab vedotin and trastuzumab emtansine) were recently approved for applications in oncology. 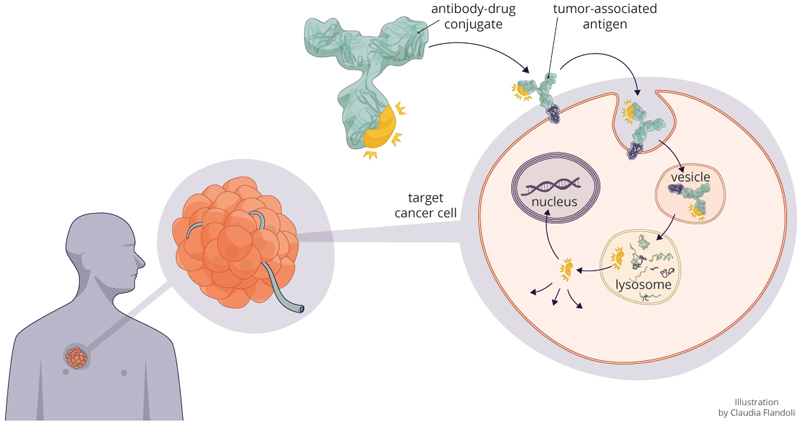 Several radioimmunoconjugates and immunocytokines, as well as >30 antibody-drug conjugates (ADCs) are currently in clinical trials and show enormous promise. Glycoproteins are the center of many vaccines that are either in the clinic or in advanced clinical trials. Usually, for a specific and robust immune response the carbohydrate antigen must be conjugated to a protein carrier. The conjugation process often results in heterogeneous products that contain a mixture of species with different antigen to protein ratios at different sites and, potentially, different pharmacokinetic and immunological properties. With recent advances in oligosaccharide synthesis and site-specific protein modification methodologies, it is now possible to design and synthesize chemically-defined glycoproteins. We are particularly interested in building pure glycoprotein vaccine constructs with antigens placed at precise sites that form defined shapes within the protein carrier. It is our believe that this will help us to understand antigen presentation mechanisms and, hopefully, provide vaccine candidates that result in a robust immune response. This project benefits from a close collaboration with Drs Roberto Adamo and Francesco Berti at GSK Vaccines, Siena, and with Dr Francisco Corzana at the Universidad de la Rioja, Spain. Akkapeddi P; Azizi S-A; Freedy A; Cal PMSD; Gois PMP; Bernardes GJL Chem Sci 2016, 7, 2954–2963. Adamo R; Nilo A; Castagner B; Boutureira O; Berti F; Bernardes GJL Chem Sci 2013, 4, 2995–3008.